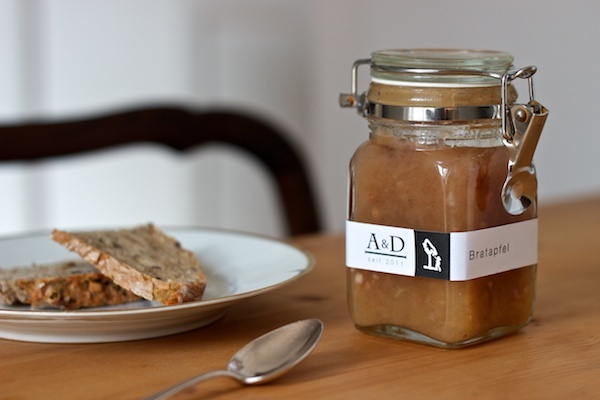 A&D Marmalades is a collaboration between myself and my lovely girlfriend Alide. We both enjoy all kinds of marmalades, jams, and jellies as well as making them ourselves and sharing them with friends and family. We wanted to make this experience even better and more unique by building a small brand around our partnership. Thus was A&D Marmalades (seit 2011) born. We chose the apple picker as our mark because its symbolism as the root and simple beginning of every good marmalade. Since we are a small operation we chose to keep our logo raw, still maintaining the original outline made by the paintbrush. We use many odd shapes and sizes for bottles and so we needed a simple solution to fit them all. A thin paper band solved this problem of varying heights while encircling any diameter jar.